It was a Friday evening. I had downloaded the app Petfinder.com to my iphone. This was an easy way to keep up with the postings that seemed to change daily and hourly. 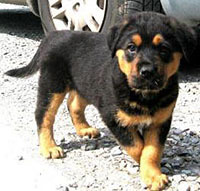 In fact, I had seen a pup that I wanted so badly, but he was a bit older than we were looking for. But that face just kept calling to me. Then one day, I went back on the site to check on him again…and it said, “He is no longer available.” I wasn’t sure what that meant, but I was hoping that it meant that someone came to get him to take him to his new, loving home and not some other, awful reason. So, I pushed that thought out of my head and just thought the best for him. 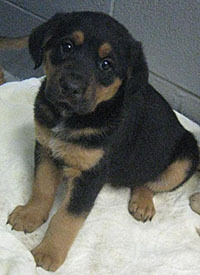 But one Saturday morning, I came across another picture of the cutest little guy that was similar to the older pup that was not available now. Oh, my goodness, I think we have found our pup! Don was still sleeping. It was early, like 6:45 a.m. or 7:00. Should I wake him? No, I’ll wait for him to wake up, then I’ll show him. You see this particular pup wasn’t going to be just another dog for us. He was selected to be the main character in our new kid’s guide to puppy care. It’s a story, from the pup’s point of view on being taken home to live with his new best friend and his thoughts, feelings and comments on being trained. This little guy was a real character. We knew him. He was sweet, with kind eyes, a a gentle temperament for kids. Our little guy was on the large side and also had that magnetic personality that draws people and especially kids. And as soon as we saw that face, we knew this was the one. This was our Roc. Well, I sprang out of bed to run to my office. I’m not sure what made me decide that I could even try to get this little pup. I mean, c’mon, he is in Virginia. A good 7 hours drive from where we live in Ohio. This is crazy. But there was something about his eyes, his face, his expression and his stance. I had to try. What could it hurt? They had just posted it that morning. I mean someone else was up at that early hour posting the pictures and the story about this litter of pups that they had acquired. I just felt in my heart that I was supposed to see him, first thing that Saturday morning. I didn’t think they would last long. Over the next day or so, I did receive communication from a staff member that they had indeed gotten our application and would somehow make this thing work. We were delighted. And we did make it work. With e-mails, phone calls, references and figuring out the pick-up arrangements, we finally had a date and time that we were to pick up our new pup. Luckily it was a beautiful day for a drive. Don took off work on a Friday and we started out early after an alarm wake up at 3:40 a.m., we finally left at 5:00 a.m. and headed towards Virginia. As dawn broke, we were well on our way approaching the West Virginia border. In just a few hours, we would finally meet this little guy. 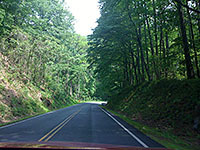 It was a beautiful drive down West Virginia and into Virginia way. Wow! What gorgeous country. Through the mountains and looking out at the countryside was a welcome perk to our city life back in Ohio. Due to our work schedules, we rarely get the chance to take off and just relax. So, this was kind of like a mini vacation for us. Using our GPS – we call her “Jeannie”, she safely navigated us to our destination. 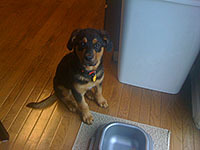 The home of the foster parents for Max – or Roc as he was soon to be called. As we pulled up their driveway, we were so excited to meet him. How would he react? Would he be nervous and not want to come to us or greet us? Would he be so excited that he would be jumping all over us? Well, we will soon see. Don knocked on the front door. We could hear that this family had quite a few pups, cats and maybe a few other species in there. It takes a certain kind of person/s to be a foster parent for animals, indeed. No one came right away, and I started to go around the side of the house, thinking there was another entrance. But then a kind lady came out of the front door carrying our new pup. Don and I just looked at each other in disbelief. Oh, my goodness. This is the pup we had envisioned. He was perfect. This was our Roc! How did we know that, I bet you are asking yourself? The way his kind eyes met ours, that expression and look on his face that said, “Can I go home with you?”, the way he just hung on her arm as she was showing him to us. It was just him. It’s hard to explain, but we knew. We just couldn’t believe that he was ours. The nice lady said that she had given him a bath, and that he had a little bit of stomach problems earlier in the day, but that she thought they were all cleared up now. Well, we were hoping that she was right because we still had a 7 hour or more drive home depending on how many stops we would need to make with the little guy. She gave a full bag of his food that he was eating, his paperwork with all of his medical information and we were on our way. 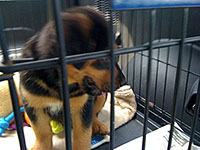 We had come prepared with a clean crate complete with a soft towel, a lot of chew toys (since she warned us that he was a big chewer), plenty of water, dishes, paper towels and a bucket with a lid, and newspapers, just in case if he would get sick or not be able to hold it until we could pull over to stop. We pulled out the driveway and headed back home. Roc on the road back to OhioWe could tell he was nervous, and he started yelping. Don and I just looked at each other. It’s gonna be a loooonnnng ride home. I tried to give him little bits of some treats that I had and that satisfied him for a short bit. We knew that there was a McDonald’s not far from the foster home, so we could let him get out and go potty while we got ourselves some lunch. But before we reached the McDonald’s, came this ear piercing screams from the crate. Oh, my goodness! We hadn’t ever heard such crying. Was he hurt? Is he ok? What is the matter? Well, it didn’t take long before we got the answers to those questions. And the foster mom had only been trying to make us feel good I think when she said, “I think he’s over the stomach thing now though.” Uh, huh. I don’t think she wanted to scare us thinking of having that problem all the way home to Ohio. He had an accident in the crate. After he was done, he moved away from it, hung his head and just looked at me as if to say, “I’m sorry, I am humiliated. I didn’t mean to do that!” Oh, the poor pup. Good thing we brought what we needed. We stopped at the McDonald’s and let him out of the crate to finish up going potty, while I cleaned up the crate for him. We let him play a bit while we were eating and finishing up and we were on our way. Other than a few other incidences, which he was not happy about either, he finally just laid down to sleep. What a good puppy. We rolled into our driveway back in Ohio about 8 and 1/2 hours after leaving Virginia. It’s been a long day, but we were so happy to be home with our little guy, our new pup, Roc. Well, when we finally came home, we figured that Roc would need to check out the back yard first and find a place to go potty. And we were right. Whew! That was just what he needed. But then he noticed a few curious creatures checking him out from inside the house at the patio door. What is that? Oh, yeah. Looks like there’s a black cat just like the one at the foster mom’s house. Cool! He was always fun to chase. Hmmm…a tabby looking one, and a tuxedo kitty…kinda on the small side. That one will be fun for sure! 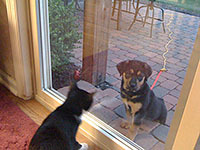 So, he came up to the patio door and the little black and white cat, Miley was there safely on the other side, just trying to figure out who this was. I’m sure she was wondering why in the world we would bring this thing home, but was willing to check it out and give it a chance. They just stared at each other through the door. You know, kind of sizing each other up and getting acquainted. But then Roc decided he wanted to be up close and personal and we let him inside to greet them all. Wooooeeeee! What fun for Roc! Cats were flying, hissing, and running through the house as the chasing began. Upstairs, downstairs, around the stairs. There was indeed going to be a getting to know you and trust you period before they would be expected to get along peaceably. Our three cats were not very happy about it at all. They thought that it was a dirty trick. Why did we need this…is it a dog? Great…he’s gonna be a pain!